The government is making concessions in Yemen in a bid to end the protests of the Houthis in the capital. A source close to the president has revealed that an agreement has been reached between the government and the Houthis for the nomination of “a new Prime Minister within 48 hours.” There is hope that the tension will soon die down as envoys from the UN and the Gulf Cooperation Council arrive in Sanaa. The protests began in July. According to the source, the nomination of a new Prime Minister will also oblige the Houthi protesters to “dismantle their protest camps and pull their armed men” away from the capital and its suburb. An official announcement is yet to be made and it is still unclear if the accord will be respected because a similar presidential initiative of naming a new prime minister was rejected at the beginning of the month. 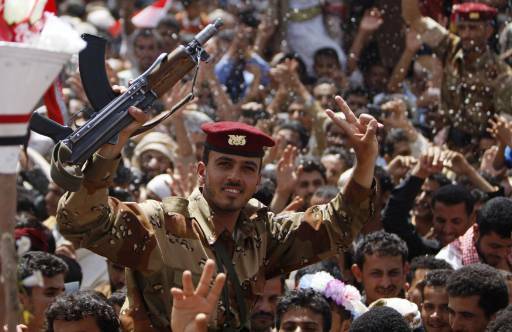 The Houthis also want to be consulted before the naming of any new Prime Minister. Analysts believe that the Houthis, who are Shias, want to impose themselves as a major political force in the northern part of the country where they are the predominant sect. Majority of the country’s population are Sunnis. The new agreement also entails a further lowering of the increased fuel prices which also contributed to the protests. A 30% decrease took effect last week. Written by: Jaber Ali on September 12, 2014. Posted by Jaber Ali on Sep 12 2014. Filed under Headlines, World News. You can follow any responses to this entry through the RSS 2.0. Both comments and pings are currently closed.